It’s that time of year when my general tea intake is a bit higher than usual. I find it so comforting when winter temps are keeping me inside longer than I’d like, and I’m always on the hunt for different combinations to try out. 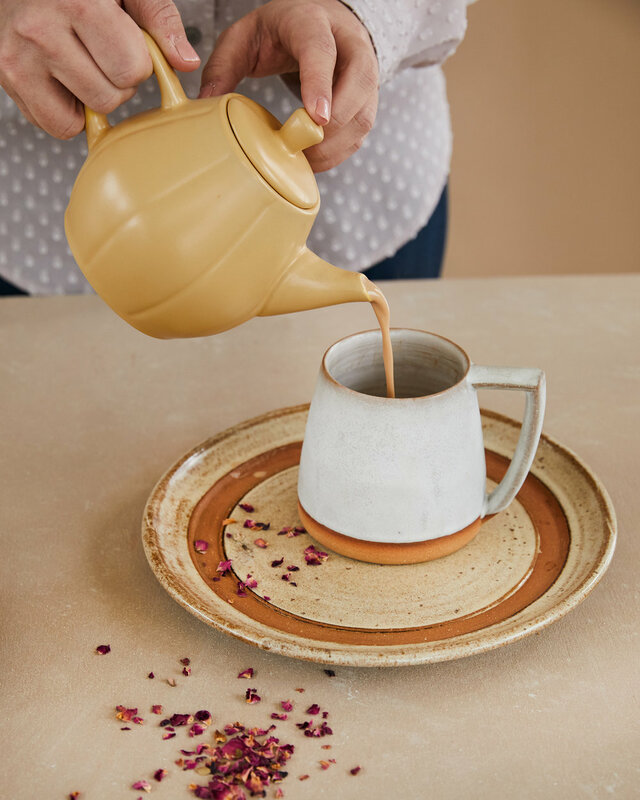 With the polar-vortex behind us, and winter back to business at usual, all I am craving as a write this is a cup of this Homemade Maple Pecan Chai Tea, created by Alexis Siemons of Teaspoons & Petals last week. Alexis and I met purely by chance at a women in food event at High St. on Market in Philly last year. My mother-in-law had an extra ticket to an oyster pairing dinner and I was elated when she asked me to join her. There were tons of people in attendance, but somehow I got chatting with Alexis, and we quickly realized that she went to the same Friends school as my husband. We then realized we lived very close to each other in South Jersey, and had a myriad of similar interests, don’t you love when those chance meetings happen as an adult? Ever since we made the connection last year, I’ve been itching to get her to my home studio to make me some sort of delicious tea concoction that I could share with you. We finally made it happen, and the results are rather delicious. 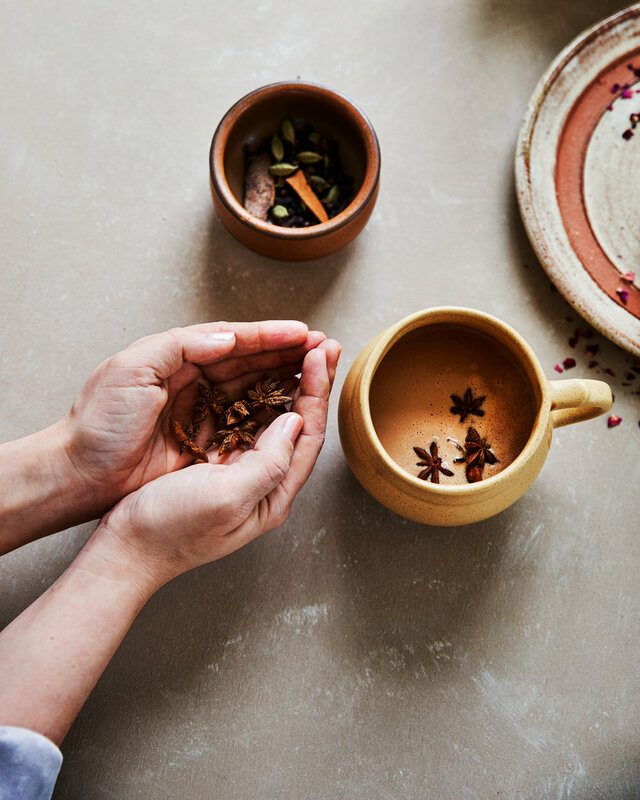 Alexis took over my kitchen to blend up this beautiful chai tea, that can be adapted so many ways to suit your palette preferences. Keep scrolling to hear more about Alexis, and to get the recipe! Alexis is a Tea & Wellness Brand Strategist who has worked on all sorts of cool projects. I’ve been increasingly curious about the tea realm, and I’m thrilled that Alexis was happy to share some insight. and the beauty of creating a mug collection. Read on to hear more about her! BH: Okay, tell me everything! You’re a Tea & Wellness Brand Strategist, what does that entail? How did you get started? AS: My adventure in the world of tea and wellness began over 11 years ago when I created my tea blog while I was still working in the world of advertising as copywriter/brand strategist. As an eternal student, I dove into the world of tea - poured over pages of tea books, attended tea conferences and even studied the foundations of tea (biology/chemistry of the lead, cultural practices, growing regions) via the Specialty Tea Institute. 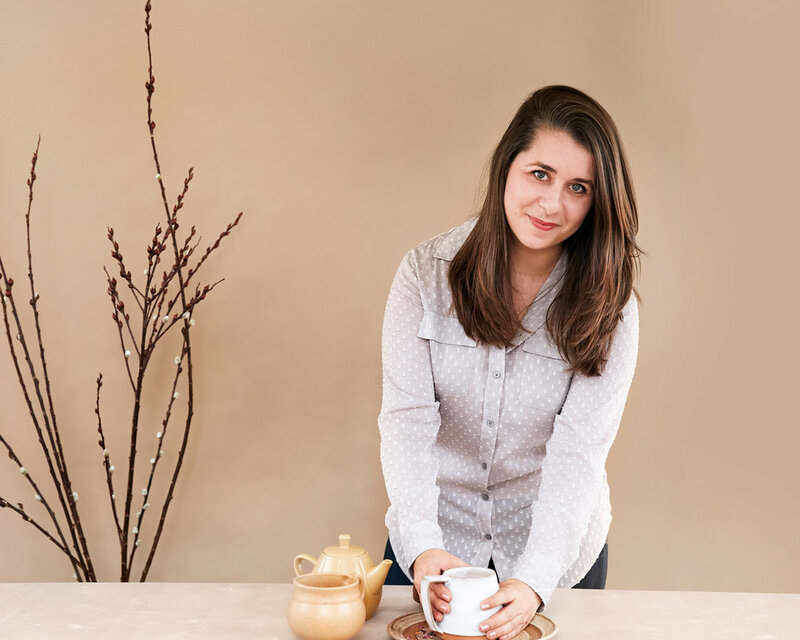 My passion project transformed into my career when I shifted from the world of 9-5 to the life of an entrepreneur to pursue opportunities with tea clients. I drew upon my background in marketing and love of the culinary world and began working with brands to build and strategically market their tea collections, teach classes about tea, write articles about the nuances of tea, and crafted two mini journals about the art of cooking with tea. 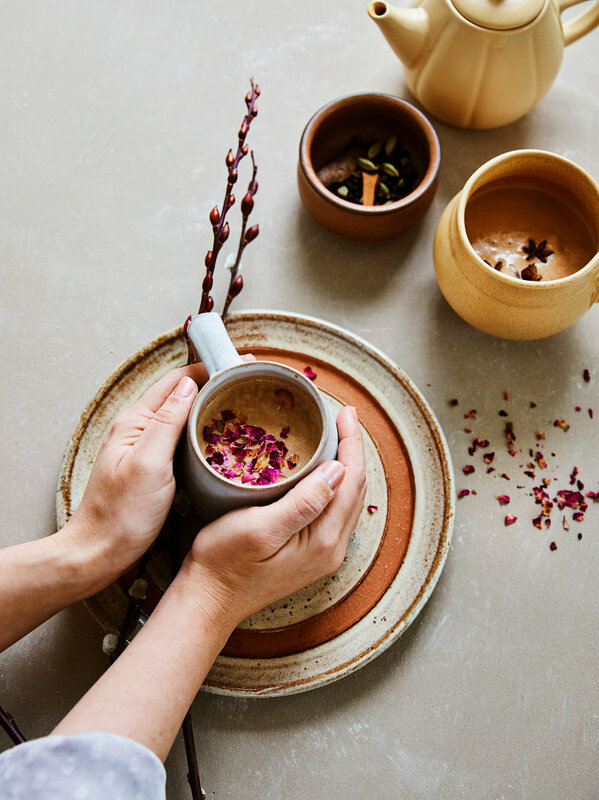 With an increasingly strong growth in the wellness market over the past two years, I’ve seen an overlap in the world of tea that’s been really exciting to watch unfold. I recently started working with brands in the world of wellness, from Superfoods to HomeGoods. really exciting to watch unfold. BH: I know you’ve worked in a diverse range of areas in the tea world. What does a typical tea collaboration look like for you? Does “typical” even exist? AS: While a lot of collaborations draw upon my knowledge of tea and background in brand strategy, the specifics have varied. When working with brands to develop a tea collection, the process always begins with identifying sourcing partners, and concepting the tea selection, or creating custom blends based on core flavors and flavor profiles for the desired market. It then moves into developing the operational strategy, working on the brand’s creative identity, and situating the overall brand strategy (creating customer profile, brand launching, writing all necessary copy). The final steps generally involve customer engagement and creating unique content to promote education- think recipes, blog posts, stylized photos, and of course, social media! Beyond the development of tea collections, my collaborations have also taken form as events with restaurants and brands. BH: Speaking of collaborations, any favorites to date? AS: To date, one of my favorite collaborations has been working with La Colombe to develop their cafe and retail tea collections for all 30 of their cafe locations, as well as online. From considering which flavor profiles would work in a coffee environment, developing operational strategies to incorporate the tea into the cafes, designing custom gram weights and material choice for sachets that would deliver the best cup of tea, designing educational training materials to baristas, to crafting creative content to express the essence of each tea, it was truly an incredible journey. Plus, I had the opportunity to work with their wonderfully talented team to bring this concept to life. BH: Are there any tea rituals, or different types of tea that might not be as widely known here in the states that you’ve discovered? AS: While matcha is quite the trend, I would have to say that the art of authentically preparing it is not as widely practiced as it should be. Yes, we have it in our smoothies, ice cream and lattes, but I highly recommend incorporating a traditional matcha ritual into your weekly routine. From sifting the matcha, making a paste with water, topping with 2-4 oz water, gracefully whisking with a bamboo whisk achieve the ultimate foam, to the first sip - this is a form of tea theater for the senses that is not to be missed. The art and ritual of properly steeping tea has recently started to pop up in food media but is still quite foreign in the states - using water heated to the proper temperature, using whole leaf tea, steeping it loosely in a cup (not a tiny tea ball) for the proper amount of time - not only do these foundations of tea lead to a better flavor - but you will find that the ritual of making tea this way will leave you with a grounded, and peaceful state of mind. BH: I have to ask, favorite tea of all time? AS: I flip between the floral and buttery notes of a High Mountain Green Olong (like a Lishan) from Taiwan, or the vegetal and oceanic notes of a Shincha Geen Tea (first flush Japanese green tea made from the year’s first plucking of the tender leaves in the sencha tea fields from April through May). More details on my love of Shincha can be found here. BH: I have a feeling not all teas are created equal… are there any quality differences or issues that people should keep an eye out for when purchasing tea? AS: When it comes time to select the ultimate tea, keep your eyes out for the freshest whole leaf! Whole leaf tea will not only steep to reveal more nuanced flavors, but can often be a sign of an artisan, handmade approach, rather than those cut finely in a factory setting. This style of tea leaf can be found in both sachet and loose format. Just be sure to opt for a sachet (AKA tea bag) that is not flat, and made of bleached paper. Seek out sachets that are made with plant based materials are of a large shape, like a pyramid, to allow for optimal water flow and leaf expansion which results in a more flavorful cup. To seek out fresh tea, check expiration dates on packaged tea or seek out smaller brands that are direct to garden and share harvests date, or even document the thing process at origin. that the art of authentically preparing it is not as widely practiced as it should be. grounded, and peaceful state of mind. BH: We spoke a bit about the beauty and significance of collecting mugs, can you talk a little bit about that? AS: I can still remember the day where my teacup collection outgrew the cabinet constraints, and overflowed into an entire bookshelf. As my collection has grown, I have become much more discerning about the cups that I welcome into my home. I have recently started to carefully select from talented ceramic artists, a custom matcha bowl was a recent purchase, and there are those cups that I treasure that connect me to family and friends, from my great grandmother's cup to a gift from one of my dearest friends. When sipping tea from the personal cups, I feel as though I sipping with them. It's so very special to me! the cups that I welcome into my home. BH: I’m finally getting on the matcha train, so tell me… where can I find the best quality matcha? AS: I am thrilled to see how matcha has transformed from a trend to a welcomed part of our daily lives. That being said, you have to be much more discerning when selecting your matcha as there are imposters in the market that aren’t respecting the art of the leaf. For pure sips, seek out brands like Matchaful, In Pursuit of Tea, Ippodo, or Kettl that offer spectacular grades (keep in mind that you will be spending $25-$45 per 20g tin - and will be using about 2g per whisked cup). Most respected matcha brands will offer tasting notes to help guide you towards one that fits your personal taste. If you prefer adding matcha to a milky latte or smoothie, opt for those noted as culinary or ingredient grade that will not only be less expensive but also offer a stronger flavor profile that will stand up to other ingredients. Lastly, consider purchasing a bamboo whisk that will truly elevate your matcha experience in terms of a final sip and understanding the art of the ritual. when making nut milk, swap plain water for brewed tea for an instant dairy-free latte that's full of flavor and ready to sip in minutes. Heat 1.5 cups of water to a boil. Add the masala chai tea and steep for 5 minutes. Once the teas has finished steeping, pour 1/2 cup into the blender and add the pecans as well. Blend for one minute on high until the mixture is super creamy. Carefully remove the lid and add the remaining cup of masala chai tea, salt, vanilla extract and maple syrup. Blend on high for another minute until everything is mixed. Carefully remove the lid and pour straight into your favorite mug. Enjoy! If you prefer a thinner consistency, simply add more water. For a sweeter sip, simply add more maple syrup. You can also make this ahead of time and simply heat in a small pot on the stove - keep in mind that the fat in the nut milk will separate - so you will have to whisk while it heats to combine. If you don't have a high powdered blender, soak your nuts for 4 hours. Simply cover the nuts wither water, let soak, strain and rinse. If your blender does not work well with boiling temperatures, steep the tea and let it cool to room temp. Follow the directions to blend and then pour into a pot on the stove and whisk while warming.